Join us in Mandeville for the 2015 Krewe of Eve Parade!!! 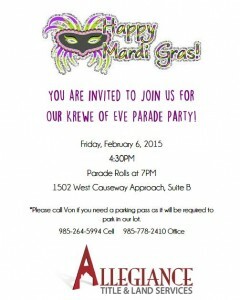 Join us at our Mandeville office for the Krewe of Eve Parade!!! *Contact Von in our Mandeville office if you need a parking pass to park in our lot! We are underwritten by First American Title and Fidelity National Title.